Plan your work, streamline work processes and increase the level of service you provide to your guests with our proprietary cloud service for task management. Serviator streamlines and simplifies work for everyone employed at your hotel and lets you choose which functions you need for your business. With Serviator, reception staff have access to up-to-the-minute information on room cleaning. They can see exactly when the room is expected to be ready and can give clear information to guests who want to check in early. They can also easily ask the cleaning staff to prioritise a certain room. Every hotel employee receives information about their own tasks and the status of all other current tasks related to their work. The icon-based user interface means that much information is automatically exchanged between the hotel’s various departments. It is also easy to send messages containing text and/or images to a colleague, a department or to all staff. 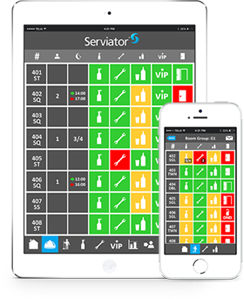 Serviator lets you assign rooms and tasks based on the number of available staff and the time needed. Assigning new tasks that arise is also easy. Serviator helps you keep track of all your tasks by letting you schedule individual or recurring tasks, such as maintenance schedules or major cleaning. Track work flow in relation to planning, see where the majority of fault reports are coming from, keep track of resource consumption and compile documentation for determining possible future investments. Serviator has been developed with user-friendliness in mind. The icon-based user interface is quick to learn and easy to use. Serviator supports nearly 20 languages and different users within the same hotel can choose their own language settings. We provide Serviator as a cloud service, so you don’t need a local server at your hotel. All you need to start using Serviator is an Internet connection. How can Serviator make work at your hotel easier? Our clients include both large and small hotels and facilities that represent every type on the market. We customize Serviator to match each venue when it comes to features, but also when it comes to configuring users, rooms and more. Below is a list of the functions currently available in Serviator. Tools that show cleaning staff all their assigned rooms and all general cleaning tasks, allow them to report faults to the property department and to report rooms as ready, the status of which is then updated in real time in the property management system. Tools that help caretakers to get an overview of fault reports and recurring maintenance tasks as well as what equipment is available throughout the building. Give your reception access to valuable information about the status of all rooms and let them easily create fault reports or other tasks based on guests’ requests, such as cleaning, VIP, room service, lost & found and more. Provide a clear overview of the number of uncleaned rooms and active tasks within all departments and more. Create you own checklists for different purposes. Let new employees receive a list of what needs to be done and view a picture of what a finished room should look like, use them on safety rounds and quality control checks, and access statistics to follow up on the quality of service provided at your hotel. Register forgotten items and generate reference numbers that help you keep track of them. For example, you can check whether the item has been returned or if the holding period has expired. Use this role for any purpose you desire or need, such as IT or conference hosts/technicians. Its basic functions are creating, assigning, initiating and completing tasks. Report minibar use and consumables to be added directly to the room’s bill in the property management system. Cleaning staff will also see which consumables need to be restocked in each room. Track work flow in relation to planning, see what has been done and when, keep track of the use of resources and compile documentation for determining possible future investments. An easy way for other departments, such as reception, to create tasks for room service based on guest’s requests. Provide detailed information to cleaning staff about what should be included in a room when it is to be prepared for a VIP guest. Helps the housekeeper assign rooms and tasks instantaneously based on staff working hours and the estimated time required. Assign emergency tasks. This area includes all cleaning tasks over and above the standard cleaning of vacated and occupied rooms, such as dusting behind the minibar, window cleaning, cleaning drains and so on. Easily send messages to a colleague, a department or to the entire hotel. Autogenerate content for commonly circulated information. You can also receive desired notifications via message, SMS or e-mail. Cut costs by keeping close check on your stock of rental bed linen and on how much you need to order to have enough for the coming days. Gain a better overview of inventories and make managing stock taking, fault reports and future purchases easy. Simplify communication between reception and garage staff who park and retrieve guests’ cars. Serviator has specially-designed features for supporting each role in your hotel and connects staff through its quick and easy way of sharing information between departments in real time. Your housekeeper and cleaning staff receive a detailed list showing their assigned rooms and any other tasks. Provides an overview of the current status of cleaning at the hotel. The housekeeper can assign rooms based on staff working hours and the time required. Receive a personalized list showing assigned rooms and tasks. Create and delegate emergency tasks and receive a confirmation that they have been completed. Minimise the manual work of handwriting notes and making internal calls. Reception gains an overview of cleaning in progress, fault reports, VIP tasks, lost & found items and more. See the correct room status in the property management system. Everything reported about the room in Serviator is updated in real time. Create simple fault reports or assignment specifications for other departments. Send messages to all staff, regardless of where they are. The property department receives an overview of all its current tasks and their priority status. All tasks are gathered together in the same place. Seven day overview of upcoming tasks. Plan and schedule long-term recurring tasks. Keep track of all inventories. Management personnel can follow developments at the hotel during the day, no matter where they are. Access to reports and statistics that help optimize the hotel’s use of resources. Check how work is progressing in relation to planning. Create and delegate tasks to staff and receive confirmation that they have been completed. Serviator is a cloud service accessed via the Internet. We manage operation, back-up and maintenance, and all your data are stored in our own hosting centre. No local server is needed at your hotel. All you need to start using Serviator is an Internet connection. Thanks to the interface between Serviator and your property management system, information can easily be transferred between the two. When a room’s status is updated in Serviator, it is immediately updated in the property management system. And when someone reports minibar use, the charge is automatically added to the guest’s bill.